The meeting will take place in Meeting Room 099 at the ExakteWissenschaften(ExWi), Sidlerstrasse12 (refer to map) near the train station. At 13:10 we will have a small meal at the Eingang UG A + EG, UniversitätBern, ExakteWissenschaften(ExWi), Sidlerstrasse12, 3012 Bern. 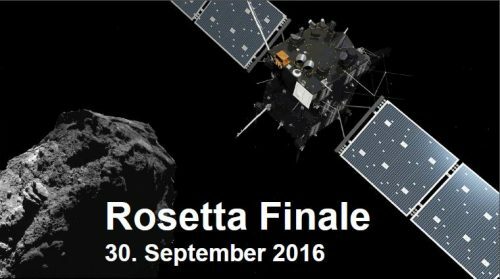 On Friday, September 30, 2016, the Rosetta spacecraft will perform a controlled final approach to comet Churyumov-Gerasimenko. In the end, it will land upon the tiny celestial body. For the purpose of the mission’s end, University of Bern invites for a live-broadcast and short presentations, starting at 11 am at Siedlerstr. 12. If you want to participate, please register at info@csh.unibe.ch your name and number of persons no later than September 25.